"In spring 2002, the sculptor Stefanie Nagorka was walking the aisles of Home Depot in Clifton, looking for cinder blocks and pavers to use in her next sculpture. Ms. Nagorka, who lives in Montclair, was losing her Manhattan studio (and lots of storage), so to determine exactly how many blocks she needed, she built the sculpture in the store's aisle and photographed it. "I looked at the photos when I got home, and had an "ah-ha" moment," she said. "I could build the thing and not own the blocks. That I had recorded this with my camera was enough." Ms. Nagorka has built many sculptures since then in the aisles of home improvement stores in 27 states as part of her "Aisle Studio" project..."
How cool!!! I hope Home Depot is smart enough to capitalize on this and pay her lots to come their stores. That is so awesome - and so easy for me to do something similar! I have to run to Home Depot later today. I'm going to price the piece in the first photo! 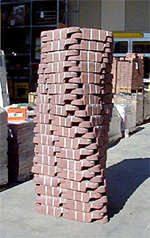 I figure about 27 round pavers. A clever person could build a career-jumping specialty out of those. Anyone have more ideas? If so, where can we find the photos? What a brilliant idea! It'll be interesting to see if this starts a creative fad. When my husband and I first started working on our garden, we decided to take our piles of materials — bricks, cement pavers, peeled Arbor vitae trunks etc. — and turn them into sculpture instead of eyesores. We photographed them before we took them down when it was time to actually use the materials. It was a great way to try out sculpture and scale in the garden and lots of great memories and photos as well. Is it copyright infringemnet if I go to Home Depot tomorrow and by 100 of those 12x12" cement steppers? Because I'm going to. What a simple, cool idea! Something like this would look good with my recent outdoor sculpture acquisition (on my blog if I can so entice you). I think it was 'CBS Sunday Morning' who did a piece on Stefanie Nagorka a few years ago. Their camera crew followed her deep into the Home Depot aisles and recorded her picking up supplies for the structure and then building it in plain sight. 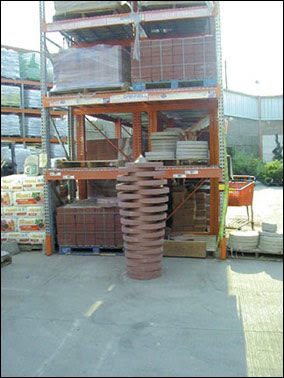 The store was not always receptive to the artistic effort, citing the onlookers who clogged the aisle and Home Depot's liability. But it WAS an intriguing show about her.